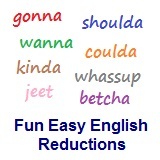 ﻿ Fun Easy English - new-american-english-reductions-reduced-words-topic-word-you-did-you-jya. In this lesson you will learn the American English reduction jya. Jya go to work today? Jya purchase that new car yet? Jya meet your girlfriend last night? Jya finish all that food? This English language reduction is used often among native English speakers in America especially among young people. Reductions, such as jya are not real words in English.